The uncertainty in assessing the numerous atmospheric pollutants transported via wind from arid and semi-arid regions is affecting the glacial ecosystem. In our study area due to the complexity of the system, a prominent seasonal difference noticed among major ions (Ca2+, Mg2+, SO42−, and NO3−). There is a need for understanding the ions cycling as a whole and the directionality of the feedback loops in the system. Therefore, we provide an appraisal of our current hypothesis for seasonal difference in major ion concentration from snow samples for two corresponding years (2013 and 2015) at Dokriani Glacier. A systematic study of chemical compositions in the shallow snow pit from Dokriani Glacier was undertaken for the pre-monsoon season to understand the cycling of major ions from atmosphere to solute acquisition process. The intimating connections of ions cycling in snow and its temporal behavior was observed and analyzed through various statistical tests. Among major ions, the SO42− has the highest concentration among anions on an average considered as 14.21% in 2013 and 29.46% in 2015. On the other side Ca2+ is the dominant cation contributing 28.22% in 2013 and 15.3% in 2015 on average. The average ratio of Na+/Cl− was higher in 2013 whereas lower in 2015. 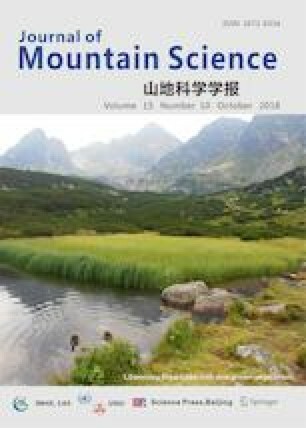 The backward trajectory analysis suggests the possible sources of the ions transported from Central Asia through the Western Disturbance (WD) as a prominent source of winter precipitation mainly in the Central Himalaya. Ionic concentration of Ca2+ in cations was highly dominated while in anion SO42− played the major role. Factor analysis and correlation matrix suggested that, the precipitation chemistry is mostly influenced by anthropogenic, crustal, and sea salt sources over the studied region. The elemental cycling through ocean, atmosphere and biosphere opens up new ways to understand the geochemical processes operating at the glacierized catchments of the Himalaya. Moreover, increasing the field-based studies in the coming decades would also have the certain advantage in overcoming the conceptual and computational geochemical modelling difficulties. An erratum to this article is available online at https://doi.org/10.1007/s11629-018-5341-3. Authors are grateful to the Director, Wadia Institute of Himalayan Geology, Dehradun and National Institute of Hydrology, Roorkee for providing necessary facilities. This research was funded by the Department of Science and Technology, Government of India, New Delhi. Author would also like to thank Dr Sukesh Kumar Bartartya, Scientist and technical staff of Ion Chromatography laboratory for chemical analysis and the entire field party members who helped during sample collection.